Miss H finally completed a St. Louis kiddos right of passage – The Magic House! Her daddy took the day off so that we could all go as a family for her first time. 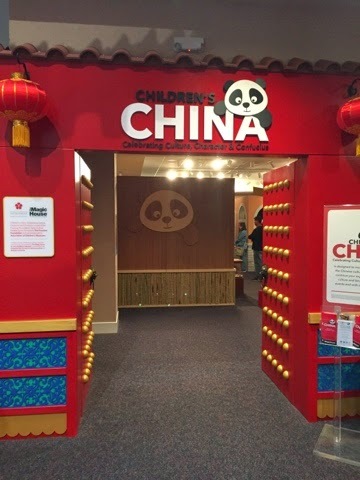 We were excited to check out the new Children’s China Exhibit too! As apart of the US Family Guide Blog Program, I was given free tickets to check everything out! Miss H and Daddy has a great time checking everything out. Learning about the culture, character and Confucius of China! 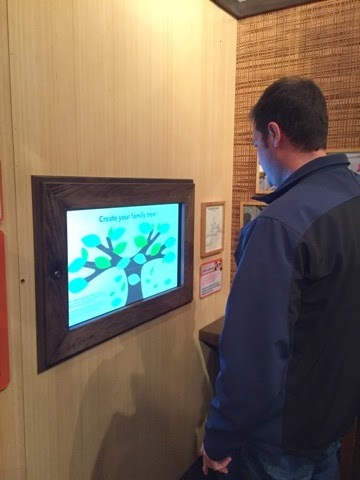 One thing we did learn – Friday’s during spring break on a rainy day call for lots of kiddos! We still had a blast though! Hattie & Daddy made a family tree! After the China exhibit, we ventured into the other areas of the house. Of course we had to stop at the Blue’s area. 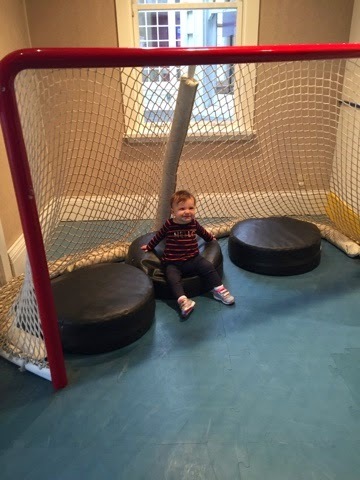 I didn’t realize that hockey nets were SO big! I was even a hockey cheerleader in high school. Maybe I didn’t pay close enough attention. Miss H loved the big hockey puck pillows and giggled the whole time! 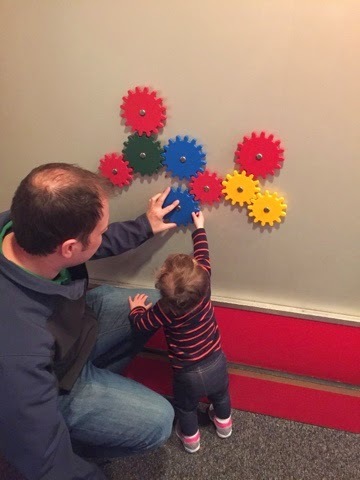 Daddy is a mechanical engineer my schooling and he’ll let you know. He had so much fun showing Miss H how gears, pulleys and levers worked. Some of the same exhibits I remembered as a kid. Now the nice thing about the Magic House is they have a section dedicated to kids 0-24 months. As much as we’d love to run all over the 3 floors, she just isn’t ready for that. There are lots of opportunities for exploring, learning, singing and a huge water table! She was especially fascinated with mirrors. 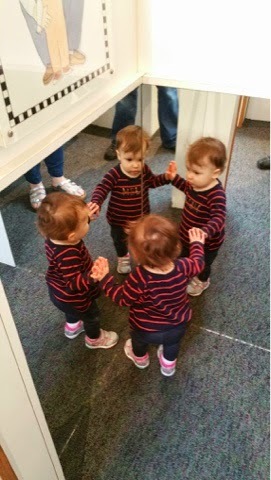 Can you imagine 4 Hattie’s? We only lasted a little over an hour. Tickets are $10 a visit per person. We’ll definitely be investing in a family membership this winter when it’s fun to do indoor things again! There is still time to take advantage of the special deal too! Use a coupon code MOM15 for Buy One Get one 50% off! The Magic House is so much fun! !